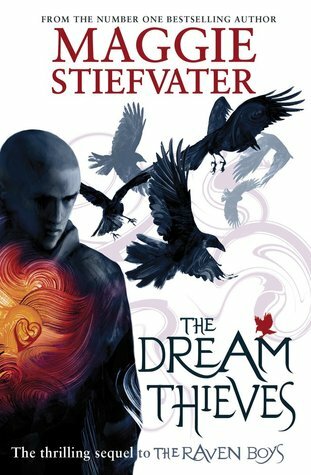 The Dream Thieves by Maggie Stiefvater (Bought) - WARNING! I cannot review this book without spoiling the others in the series. Read no further if you're planning on reading this series and don't want it spoilt for you. Now that the ley lines around Cabeswater have been woken, nothing for Ronan, Gansey, Blue, and Adam will be the same. Ronan, for one, is falling more and more deeply into his dreams, and his dreams are intruding more and more into waking life. Meanwhile, some very sinister people are looking for some of the same pieces of the Cabeswater puzzle that Gansey is after… From Goodreads. After the surprise of loving The Raven Boys by Maggie Steifvater, I was so eager to read the second book in the series, The Dream Thieves. And although I enjoyed it, I finished the book a little disappointed. The ley line has now been woken, but it has huge surges, and then nothing. It's causing stadium lights to turn on by themselves, but it's also causing power cuts. Something isn't quite right with it, and what's more, Cabeswater has disappeared. This stalls Gansey's search for Glendower. Every other time something has gone wrong in his search, he's found a different avenue to continue his search down, but not this time. Cabeswater is important, but it has completely disappeared, like it never existed. And because of this... not much happens in the book. The main focus of this book? Ronan learning more about his dreams and how to take things from then, and his character development, and also the changes that are happening to Adam, and what his sacrifice to waken the ley line means. There isn't very much in the way of moving the story forward - because the story can't move forward until Ronan and Adam work some things out, and it takes the whole book for them to do so. The story wasn't boring, because I really like these characters, and it was fascinating to get to know Ronan more, as he is one of the narrators this time round, and understand who he is, why he is the way he is - namely always on the edge of anger and looking for a fight - and how and why he is able to bring things out of his dreams. I also loved the development of his sexuality. It's not all that overt, not at first, and he never actually thinks about his sexuality, but it's clear in his reactions to people and the undertones to conversations. Stiefvater has said that Ronan is canonically gay, despite it never being overtly said in this book - though there are major clues. I'm interested to see whether it will overtly come up in the following books; I do feel a character being gay but it never being said on the page is kind of problematic. It was also interesting to see Adam become almost a completely different person. There is an anger in him that wasn't there before, and he's starting to lose himself as Cabeswater seems to try to take over his mind with weird visions. There's a lot he has to sort through, which is understandable. His dad beat him up so badly he left him deaf in one ear, and now he gets angry so quickly, and feels violent, and is worrying he might be like his dad - plus having to deal with the Cabeswater sacrifice. It's a lot to deal with. But still, nothing happens. Not until the end. There is the mysterious Gray Man, one among many different people hired by many to find the Greywarren - an object no-one knows anything about, just that it's something with power. Gray Man is a hitman, and he's dangerous, and his search has him crossing paths with Blue's family, and breaking into Gansey's home. This subplot was interesting, but fell kind of flat for me. I mean, it wasn't nearly as sinister as the subplot of Whelk from The Raven Boys. Sure, Gray Man is a hitman, and he does beat people up and kill a couple of others, but he never causes that same level of distress for me as Whelk did. And I missed Blue and Gansey. They still narrate, but not as much, and I like them both. I just wish more happened. Plus there were a number of times where when conversations are being had that I just didn't get. They were just so confusing. If I had read The Dream Thieves when it came out, and had to wait for the next book, Blue Lily, Lily Blue, I would have been really annoyed with this book, because it's not really enough. I enjoyed it, but I expected more. I hope Blue Lily, Lily Blue is more exciting.